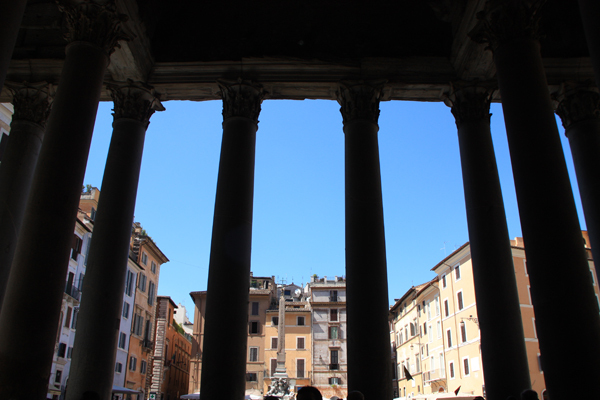 Rome has been such a different experience for me. I have gone from hating the city to loving it’s vibe, it’s chaos and wanting to come back and explore. In our 3 days all we saw was a check list of monuments and the restaurant outside our hotel, as it had the best pizza and pasta. If I was doing a list of awards for this holiday, the award for the city I wish I could have spent more time in would be Rome. 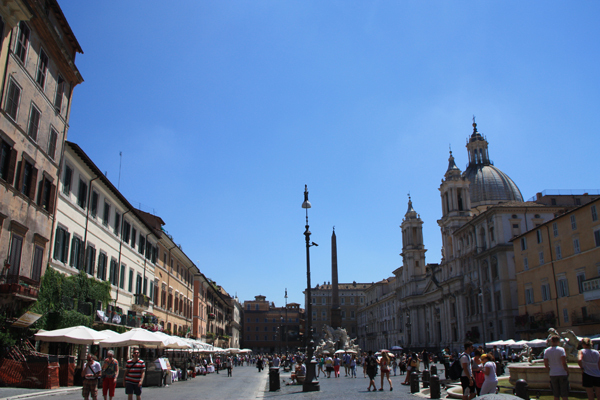 We arrive on a Friday afternoon and luckily our hotel was very central located just up from the Spanish steps. We were starving so we had to decide whether to go and find a good restaurant or should we just chance the restaurant outside our hotel, which we got 10% off at. It was busy so that was a good sign, plus we were so hungry that anything probably would have tasted good. 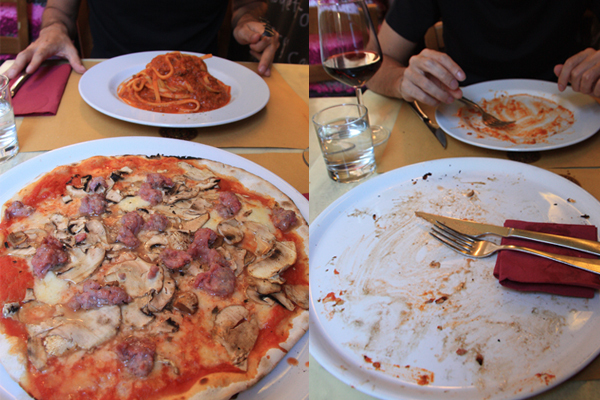 The menu was simple so we settled on fettuccine ragu and pizza with sausage, mushrooms and mozzarella. I had hoped that my small amounts of daily of gluten consumption in France had warned my stomach of what was to come in Italy, I was not going to go without here. 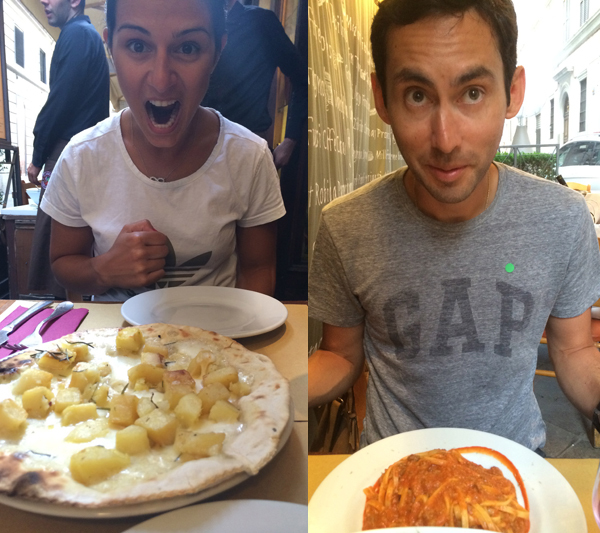 We were so excited for this meal and had been looking forward to pizza and pasta everyday for basically the whole of France. Well let me tell you, we had been there one hour and I knew this pizza and pasta would be hard to beat, this is the evidence. We debated whether to get another plate of either as we thought we were hungry still, but opted out and set off in the direction of the Trevi Fountain. 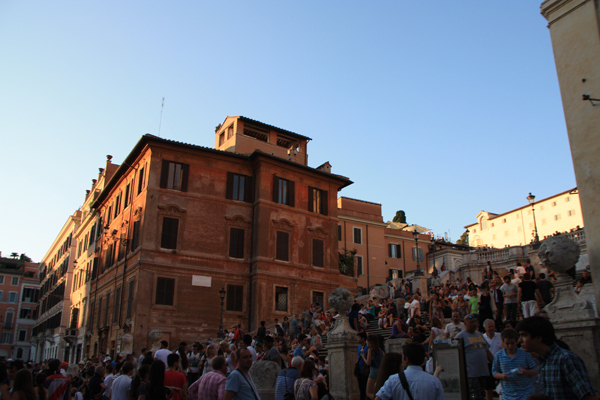 On the way there we did go past the Spanish steps and decided to sit and relax there on the way back to the hotel. 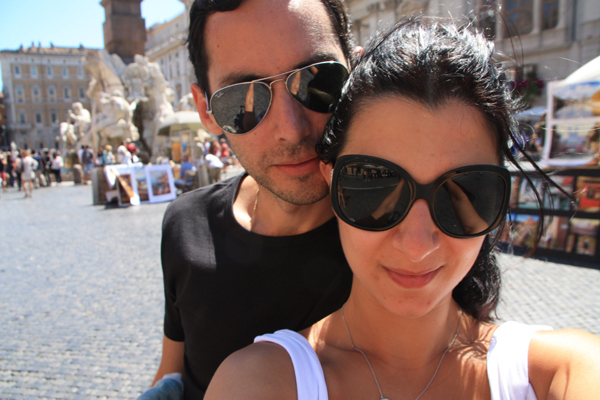 Also on the way to the Trevi Fountain were 2 major shopping streets, the first Prada, Bulgari, Dior, Cartier, Fendi etc etc. Chris was pulling me along and probably wishes he had a leash he could keep me close with so I would not run to each window and admire. Ok I was a good girl and did not go in, we continues on. Then next street Zara 1, Zara 2, Mango (my favourite shops) plus many many more. Again Chris pulled me along reminding me of the prize, ice cream at the fountain. Ok Ok. We got there. Excitement, gone. Disappointment, boiling. Scaffolding, everywhere. Water, vanished. Chris was so upset, he was saving his two 1c coins for us to throw, he did not want a photo. There were many coins thrown over the barriers and onto the concrete that once was a pond. No wishes would be happening here! 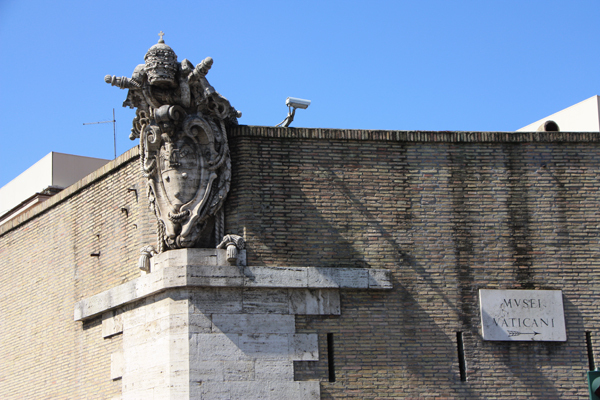 Later we looked up how long the works were taking place as we were returning to Rome a week later for a day, but nope they were to be ongoing until 2015. 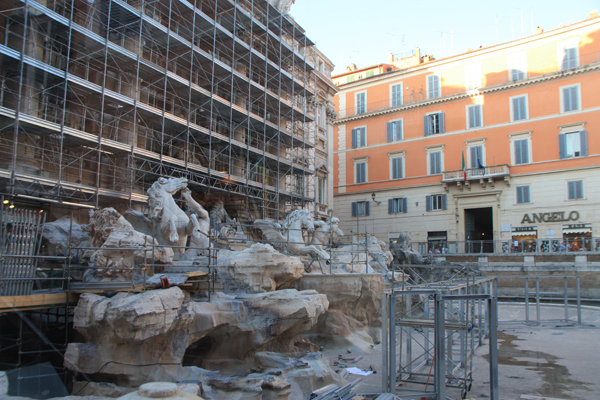 A multi million euro restoration of the Trevi Fountain sponsored by Fendi. Well thanks a lot Fendi, ruin our night. Next disappointment was returning back to the once excellent gelataria only for it to look sloppy and no Italians ready to serve. Right back out we walked, authenticity lost. 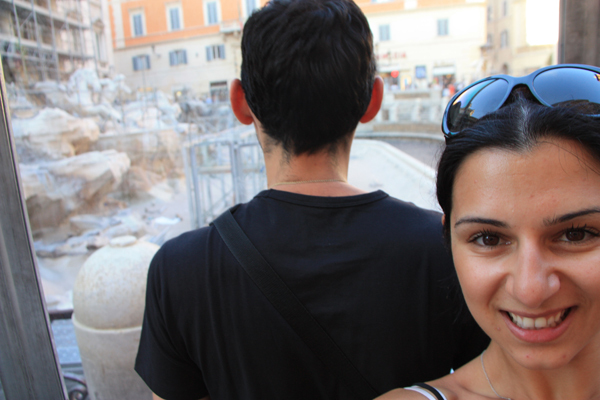 We then walked, shoulders dropped, back to the Spanish Steps on the look out for some good gelato. 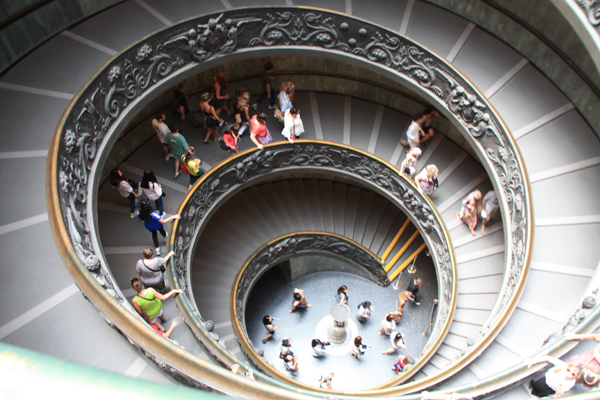 We would have walked into at least 5 places and none looked good, “what is it in these major cities, it was hard to find a good patisserie in Paris and now we cannot find gelato in rome?” we said to one another. It is as if cities have become so touristy that the chance that you will stumble upon a good little find is dwindling. LOOK those people are holding what looks like proper gelato, head in that direction. BAH BAH, success. 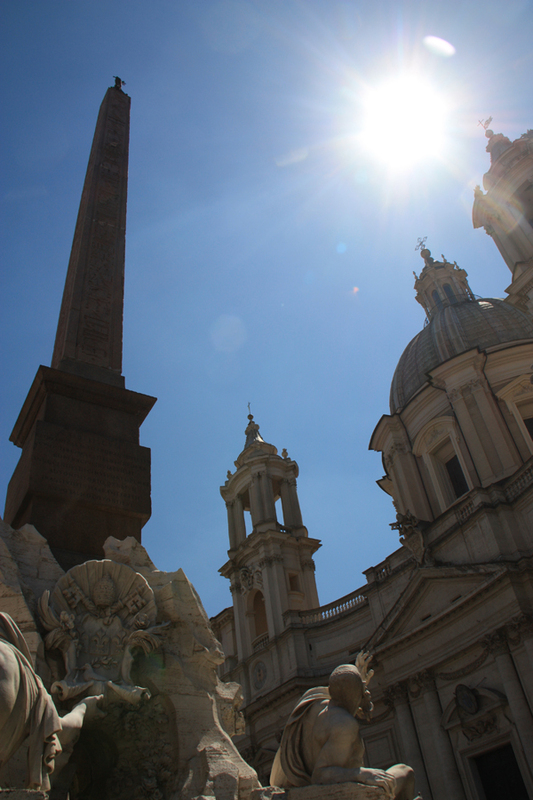 Actually just across from the Spanish Steps too…..well at least the Spaniards are still guiding us well. Double scoops were a must which we enjoyed on the steps looking out at the stupid tourists dumb enough to take roses from the man who wait for it, wait for it, there it is, will ask for money. Surely people are aware of these ploys, these men don’t just want to give you a rose, nor do the men in Paris just want to give you a bracelet, all they want is money. We sat for at least 40 minutes watching this occur over and over, still humoured every single time. Not a bad way to spend a Friday afternoon with my husband, great food, smooth cheap wine and a two scoop of my favourite flavours. The next morning we tried to leave reasonably early for St Peter’s Basilica as it was a Saturday, and the lines are always long. On the walk up to the Basilica we were asked in at least 5 different languages if we needed a guide as we can ‘skip the queues’. No thank you. Well the line was long but it was moving reasonably fast. Yes is did stretch the whole way round but was only an hour and quite a bit was under shade. So it was not until we saw scaffolding in the square then ask a staff member why there was all this construction here that we were told tomorrow, Sunday, was St Peter’s Day and not only will the museum and basilica be closing early today but tomorrow would be closed. We are extremely lucky we came TODAY. So we came, we saw, and we left. It is another extravagant church. Nice but once you have been to Sagrada Familia, no churches are anywhere near impressive, and that one is not even finished. 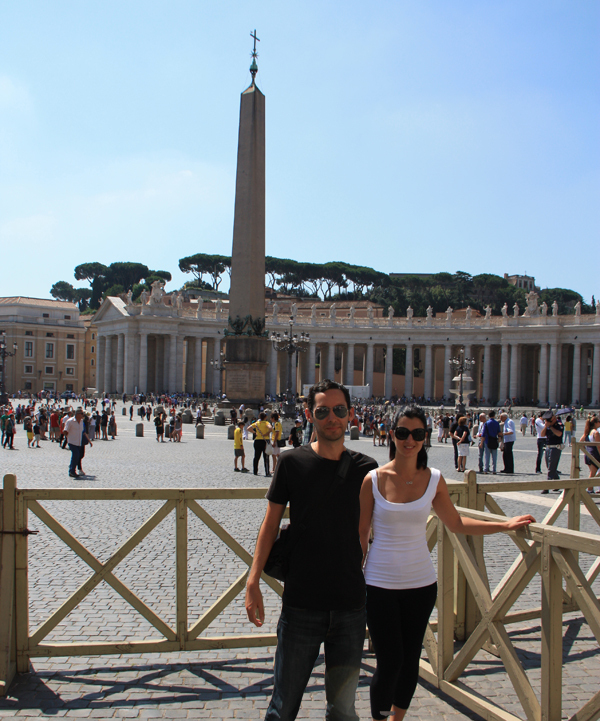 As we were walking out of the basilica we saw a sign for pre purchasing tickets to the Vatican Museum. It was a bit more expensive, but by now it was midday and getting hot outside. Yes thank you very much we are more than happy to pay tourist prices to skip the lines, please take our euros. I think if you go in with this attitude you will have a happier experience and not think back to all the lines you stood in, but how well spent your money was. ….and lines there were. We relaxed for a little in a café across from the entrance to enjoy our overpriced coffee, gelato and water in full air conditioning before we were ready to start. I did warn Chris before we entered that it is like a maze which if you power walk through the whole thing, and not even look at the art, will take you at least an hour to reach the Sistene Chapel. We did look, but quickly, or as quick as we could with the large groups blocking passage ways. Just over an hour and we made it. This time more people were talking and not so stealthily taking photos but every few minutes the police would say “SILENCIO”. Without glasses I did find it very difficult to look up and examine all the little scenes so I got over it very quickly as my eyes were burning, but if you have the time there is so much to take in, so many stories told. It is interesting that even the exit has some ‘creativeness’ to it. As you walk down the very steep ramp that has no grip you slowly meet short steps and slowly slowly reach stability and the feeling that you will not fall over somewhere towards the bottom, the only place with yellow strips along the edge alerting people that ‘this is a step’. Odd and definitely would not be allowed in Australia. If this was in Australia there would be a second ugly handrail which is the correct height above the original one, large yellow strips on the edge of every step as the light grey is not different enough to the dark grey of the step and where the ramp is too steep there would probably be perpex steps built over the top to ensure that noone would sue the building for ‘falling over’. I am so glad we are not in Australia right now. 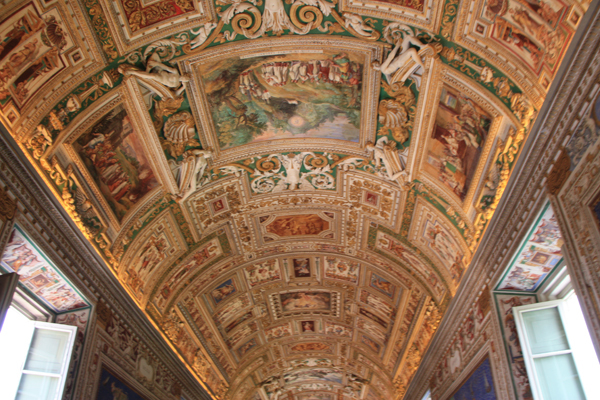 We were met with the same situation as I was when I left the Vatican Museum 5 years earlier, severe hunger. A whole morning of waiting and looking around the smallest country in the world is draining, so we walked through the little alleys hoping to find anything and then tada we hit the Piazza Nuova. It normally has a plethora of different artists from musicians, jewellers and painters but today seemed rather quiet. We enjoyed people watching from one of the cafes around the edge of the piazza, ours even squirted cold water mist over you to cool you down. This definiely heightened our experience of bruscuetta, salad and Chris’ bolognaise. Another big attraction is the large fountain with obelix in the centre. 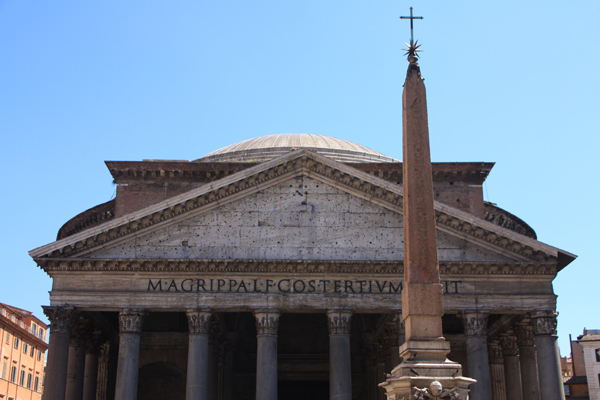 Our last stop for the day was the Pantheon. 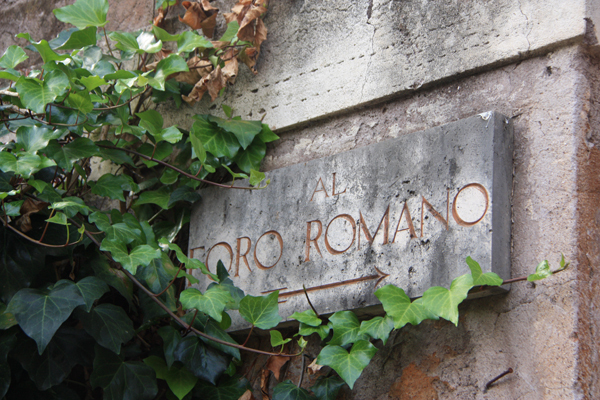 Walking there I noticed a key difference between Rome and other european cities, well cities we have thus far visited. The combination of sunlight and the colours of the buildings add warmth to the city rather than glimpses of light and cold colours of grey or white concrete. Also the fact that every road is treated like a plaza with masses of people walking along and only moving if a car is on its way, oddly, adds a relaxed nature, people are not running around frantically to move almost as if pedestrians rule. Well frantic does pick up closer towards the Pantheon. More guides offering there services but for us we thought the information signs around were enough. 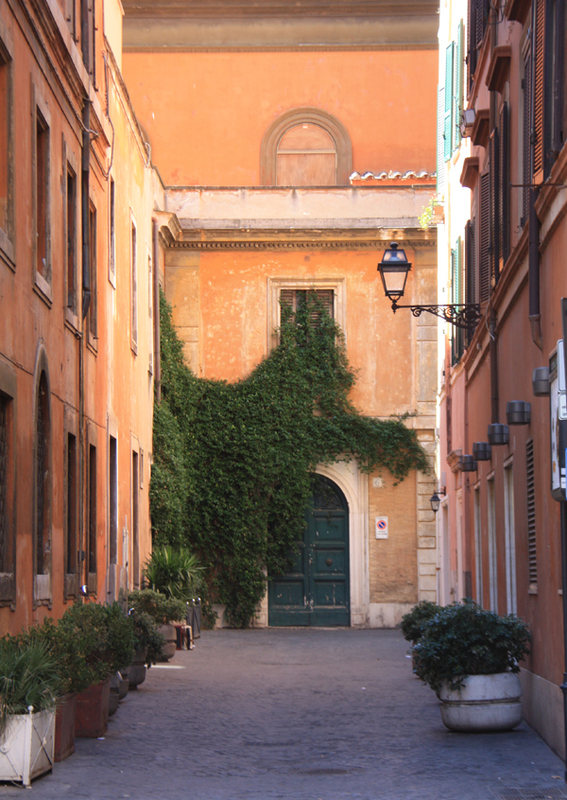 It is without a doubt my favourite building in Rome. Every time I come here it takes my breath away, maybe this is because every time I visit there is a children’s choir chanting which makes this space just mesmerizing. The light, the shadows on the ceiling, the detail of the interiors and the scale are all so beautiful. No need for our dodgy ‘selfies’ here, it can speak for itself. A great way to end our Saturday, well almost. On the way back to the hotel I lost Chris to the Brazil v Chile game so I decided to relax with some shopping but made sure I was back by 8, which I did, Chris was not. I got ready for dinner and went to find him, in the bar, not dressed, watching the game. Thanks very much guys why did it have to go to extra time, then penalties, I wanted to eat. Everyone was glued to the screen (this was back when people liked Brazil). They won yay, can we eat now? 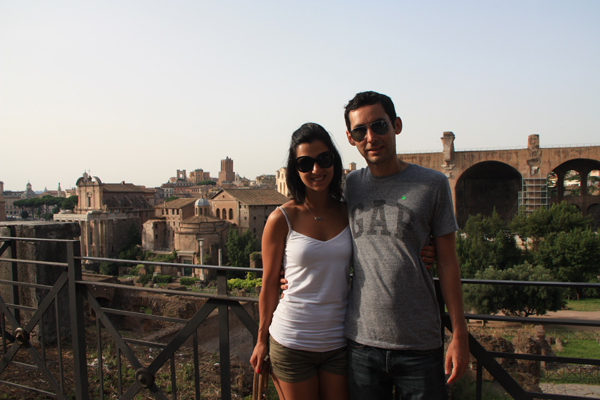 We had decided to try the rooftop restaurant in our hotel, little did we know that a lot of Rome had that same idea. It was packed and we did not have a reservation. We were yet to stay in a hotel where people actively seek out the restaurant so it was a shock to us. We had our cocktails and waited. Finally we were seated and ordered as quickly as possible. 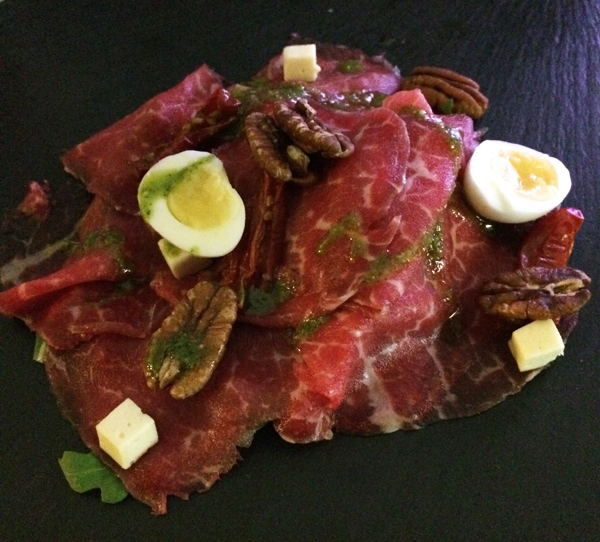 Entrée was delicious, beef carpaccio with quail eggs, pecans on a rocket salad. Happy Trish and Chris, but not for long. Mains were a complete disaster. The pasta was so horrible, thick, undercooked and gluggy that they were hardely edible. The things we do when we are hungry, hoping every bite will get better. In hindsight we should have sent them back but hunger does funny things to people. (definitely not photo worthy). 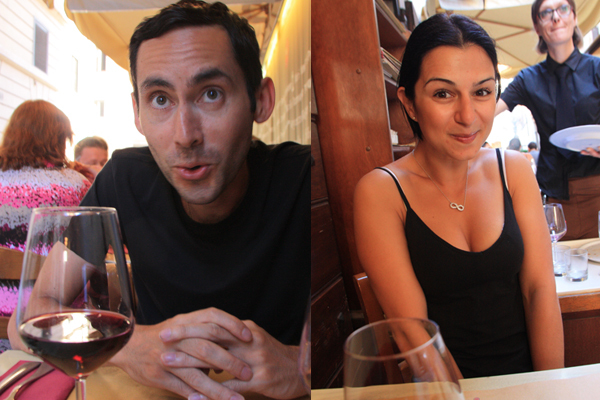 We finishes our wine as quick as we could to get out of that terrible place wishing we had pizza and pasta again. So we decided to at least get some enjoyment out of a few more wines and some live music at the piani bar. It started to get quite busy and before we knew it some americans were up and dancing. It was a funny sight as the girl knew how to salsa but the guy truly did not. After a few wines Chris gets quite proud and wanted to show them how it was done so grabbed me and spin, spin, spin, spin. I am not a good dancer but I would say that I gave a better effort than that guy. Chris was satisfied and sat down for the rest of the night. Before we knew it it was 2am and we had an early train down to the Amalfi. We must have lost time after another bottle or was it the haze of smoke as that everyone was puffing that did it???? Amalfi story will come shortly. We headed back to Rome for one more night after our fantastic trip to Amalfi as it did take a good 4 hours to travel between them and we needed to rest before another half day of travel to the Greek Islands. 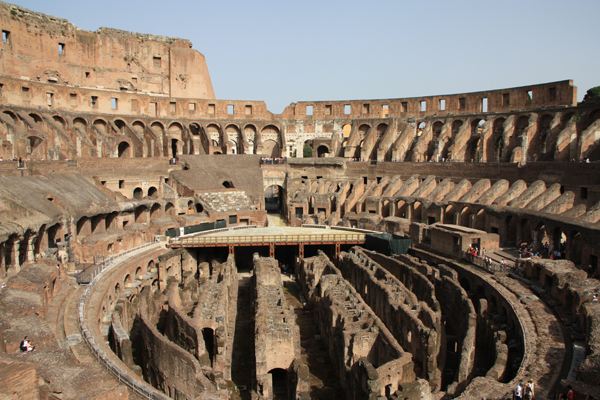 So we got back to Rome around 4 in the afternoon dropped our bags and set of for the last item on our checklist, the Colloseum. 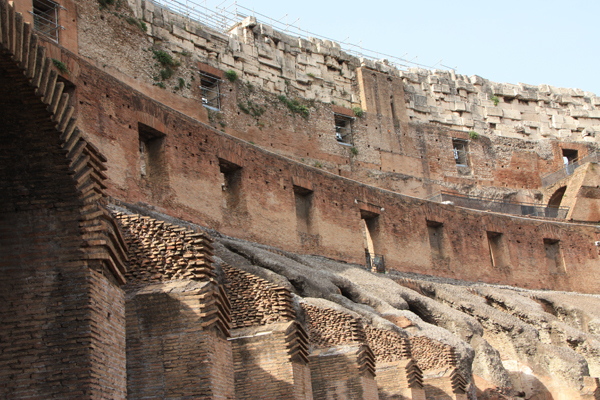 We looked online and there was a tour which included the space under the colloseum at 4:30. Metro was not going to work so we jumped in a cab and power walked making it just in time. We asked the staff but were informed that the tour we wanted is booked out months in advance and we would not be able to get in this summer. Well ok, that did not go according to plan. This is when anoying people asking if you want to join their tour are welcome. So we joined a group, got straight in and heard this eccentric man go off on tangents and talk about the colloseum, that was until we were told we only had 20 minutes free time in the colloseum before our next tour of the Roman Forum was about to start. Tour suddenly did not seem like a good idea. Who actually liked being rushed? We had paid so we decided to just see what we could then get on with it. Thankfully the second tour was with a different guide, this guide was an overenthusiastic British ex teacher who was in love with Roman history. Although we were hot and bothered it was a great tour and really informative. We learnt that the Arch of Constantine here outside the Colosseum was the first arch, built in the 4th century, and apparently the one that the French Arc De Triomph was based around. 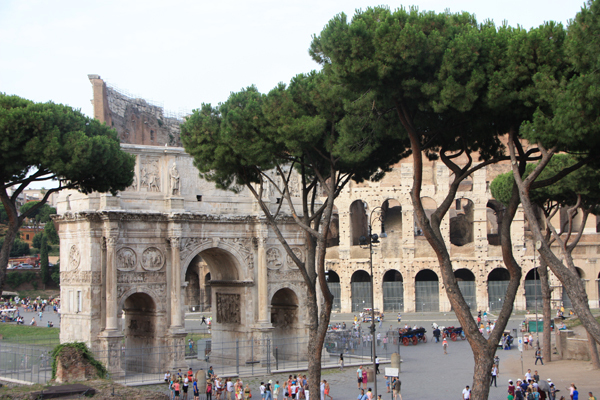 We also got a great view of the Colosseum without all of its scaffolding. Then saw what would have been the original and grandest basilica (the large building with domed ceilings behind us), which is much much larger than St Peter’s is and what St Peter’s is based on. 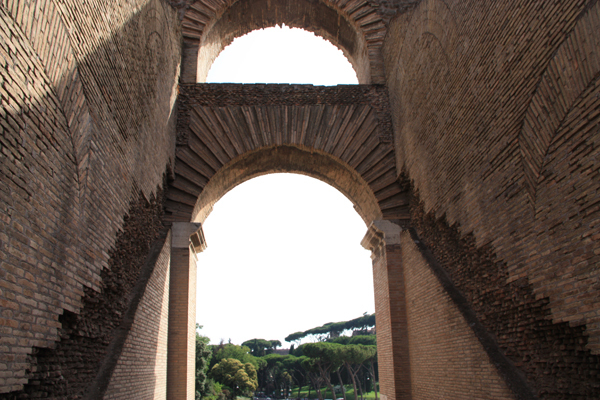 The Basilica of Maxentius. 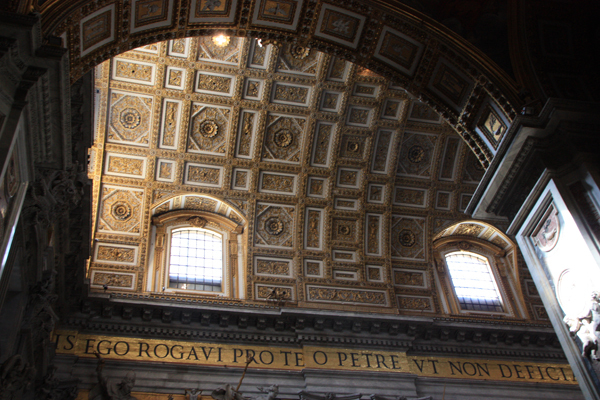 The only difference between what this would have been and what St Peter’s is is the dome on the top, which the architect added and Michelangelo advised to raise to make it very tall. So the architect really did not do much except copy a design and add a dome, not dictate the final product. The Roman Forum used to be under a lot of silt and has taken many years of excavation to discover the remains. 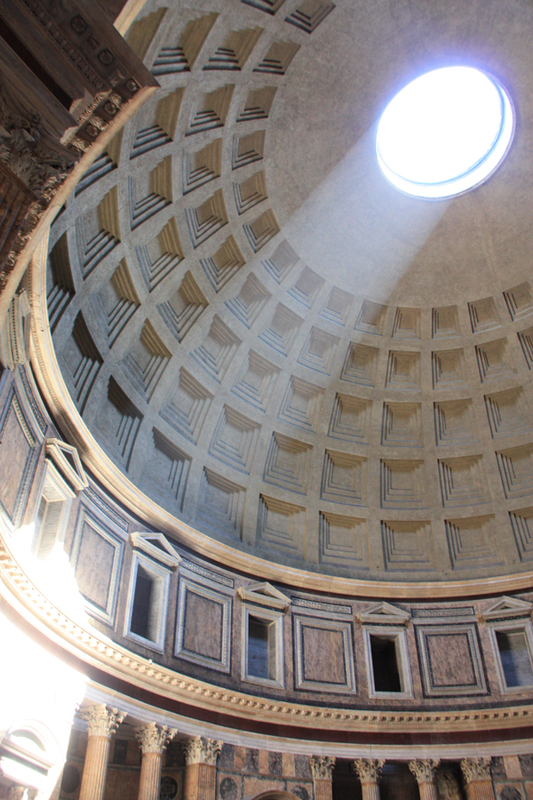 What is truly incredible is how old some of these buildings are. 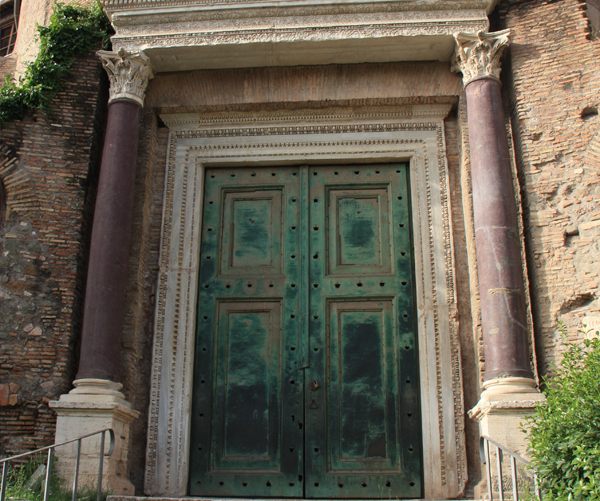 The most spectacular I think is the Temple of Divus Romulus church which still has the original bronze doors, lock and key and dates back to the 4th Century. Tick tick and tick. We were done. Now to get back to the hotel to enjoy some more pizza and pasta. This time we were not willing to share so we got an entrée pizza, potato, rosemary and mozzarella. To be honest I was so excited but I have had sooo much better in Sydney with thin slices of potato, rock salt, even rosemary spread across. Oh well I ate most of it anyways. Our mains were delicious. I had spaghetti with pepato pecorino and zucchini flowers. It was definitely a flavour punch with the cheesiest sauce I have ever had, but I enjoyed it as I do LOVE cheese. Chris got his favourite fettuccine with ragu. It was a good end to a lovely adventure in Rome. This entry was posted on July 13, 2014 by forque. It was filed under Recipes .